Innokin Cool Fire Pebble Kit is an advanced vaping device consisting of a compact 50W Cool Fire Pebble box mod and 2ml SlipStream Atomizer. 5 colors. Innokin Cool Fire Pebble is a tiny yet powerful box mod with 50w variable wattage and a built-in 1300mAh battery. It supports a fast charging Micro usb port so you can enjoy vaping during charging! High quality durable stainless steel threading with a gold plate and a spring loaded connection pin all fitted perfectly with the most standard 510 tanks. On top of all of this, the SlipStream Atomizer is also included to ensure you have the most sensational vaping experience possible. Power on/off: press the fire button 3 times in quick succession to power on; repeat it to power off it. Adjust Variable Wattage: Hold the "+" or "-" button and the set wattage will flash. Hold the button down to quickly increase or decrease the set wattage. 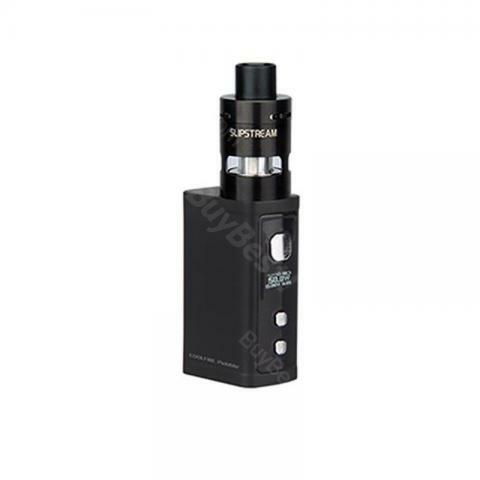 The wattage can be adjusted from 6W to 50W in 0.5 watt increments by pressing "+" "-" buttons. OLED screen orientation: Hold "+" and "-" button 3 seconds to flip the horizontal orientation of the OLED screen. How to fill the tank: Push the top cap down and turn to open the tank; Add e-liquid against the inside wall of the tank; Firmly replace the top cap. Please wait 5 minutes before vaping. • The MOD doesn't have Temperature control function. 50W Innokin Cool Fire Pebble Kit with SlipStream Atomizer is a tiny yet powerful box mod with 50w variable wattage and a built-in 1300mAh battery. It supports a fast charging Micro usb port. Good vape for those new to vaping. The tank is the standard size and the battery can run out pretty quick. So those vaping a lot might need a bigger device. However, I try not to vape often so this does me. Also some liquids can spit into your mouth, but I think this is the same with a lot of vapes.